Today was an awesome day. Four of us from my unit went to the Veteran’s Place in Pittsburgh, PA and volunteered for the Homeless Veterans Day Program. It was so different from any soup kitchen/shelter I’ve ever worked. I don’t think it can even be classified as a soup kitchen; more like a recreational facility for homeless veterans. We made them breakfast, served them lunch, and I even got to play pool with a Mr. Roberts. I was told from the beginning that Mr. Roberts loves to play pool, but that he gets quite upset if he loses. Me being an avid pool player got really excited to find someone who has the same love for pool as me, so I asked him if he would like to play a couple of games. After he won 3 times, I told him it was my turn to win. At this point in time, I felt he and I had built up a friendly rapport–he was coaching me on how to better my game and even made me go out and get my own pool stick when I told him I carry one with me at all times (a girl never knows when she has to show someone up at billiards 😉 lol). And you know, he was A-Okay with me winning.. even gave me a high-five. Mr. Roberts has found a special place in my heart. He did try to hustle me though–that sly ole fox. I was getting ready to leave and he tells me that he really liked my pool case and that he had a nice blue one to trade me (the one he was carrying). I told him that I was coming back in two weeks and that if I can find one like mine, I’ll bring it for him. I’m hoping I may find one online that won’t cost too much to get for Mr. Roberts. 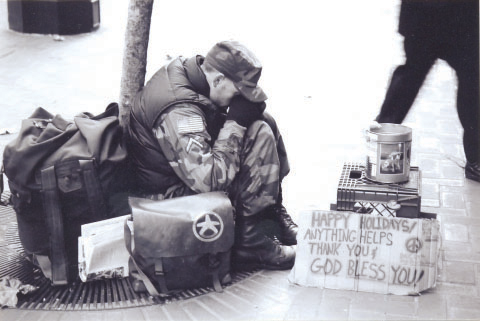 I just stumbled across this while doing research on homeless veterans. As a veteran who recently retired from the Navy, I want to thank you for your help. Every little bit helps and I am sure the men and women at this facility appreciate everything you do.